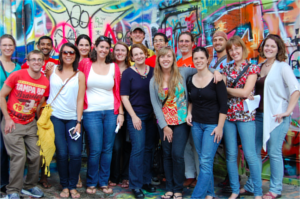 Each year on a competitive basis the Peaceworker Program invites 6-10 RPCVs to participate in a two year social change leadership program integrating three key components: graduate study, community service leadership, and ethical reflection. Fellows are supported by a graduate assistantship that includes tuition remission, health insurance and living stipend benefits. Established at UMBC with the founding of the Shriver Center in 1993, Peaceworker is grounded in the early 1960s vision of Sargent Shriver and President Kennedy who realized the potential impact of Peace Corps Volunteers returning home ready to apply the lessons and experience they had gained abroad. A growing network of social change leaders building peace and community through service and learning in Sargent Shriver’s spirit of practical idealism. To support and engage Returned Peace Corps Volunteers through a service-learning fellowship program preparing them for lives and leadership in diverse fields of public and private service. To impact pressing social needs in the Baltimore region through partnerships with community agencies involving direct and significant service of Peaceworker Fellows focused on creative solutions across a range of social concerns.